If you’ve seen the movie, The King’s Speech, which tells the story of how King George VI of Great Britain worked with a speech and language therapist to treat his stutter, you would know that his therapy was not just physical, it was also psychological. His therapist, the Australian Lionel Logue, suspected that his stutter was caused by childhood trauma. His approach was to build the king’s confidence and improve his anxiety by addressing these issues under the guise of mechanical exercises. Several studies suggest that aside from biological factors, environmental stressors such as family challenges, confidence issues, and anxiety can be contributing factors to stuttering. And it’s these same issues that make hypnotherapy a potentially viable form of treatment for people who suffer from this speech impediment. One study published in the American Psychological Association describes the case of a 14-year old boy with severe stuttering who was treated with hypnosis to overcome his speech impediment. The boy eventually became 100 percent speech-fluent, and after 10 years, not only maintained this achievement, but also made many improvements to his personality as a whole. How does hypnotherapy for stuttering work? Many patients with a stutter can often speak normally without any traces of their speech impediment. Because stuttering is suspected to be triggered by different environmental factors, consistent hypnotherapy sessions can allow you to shut these triggers out and practice speaking normally. By putting you in a relaxed state, your hypnotherapist can help reduce the impact of your triggers and work on new reactions. Much of hypnotherapy is about using the power of suggestion to condition your mind to believe in something. And the more you think about changing a negative aspect about yourself into something positive, it eventually becomes a reality. This is especially true when using hypnosis for building your confidence and self-esteem. With constant positive conditioning, you can adopt a mindset that allows you to stay confident under pressure and, in the case of stutterers, speak without any speech problems. Hypnosis can also be used to help patients address the root cause of their speech challenge by helping them remember when the stuttering first happened. Your hypnotherapist will help you analyze what triggered your stutter. Was it a traumatic event? Was it a family challenge? With consistent hypnotherapy sessions, you can confront these negative emotions in your subconscious and bring about positive change. 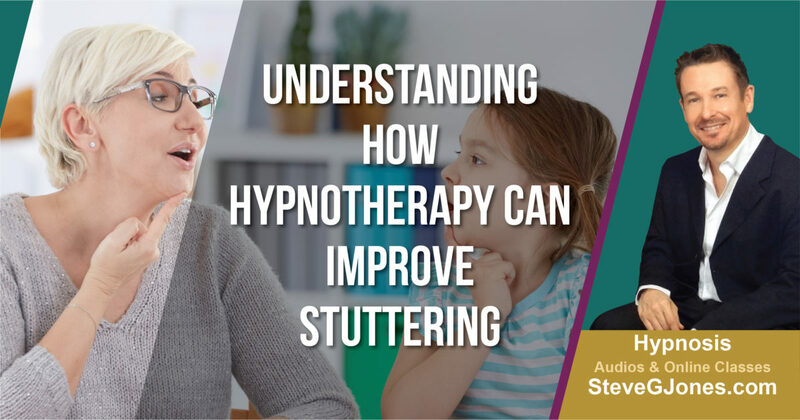 If you’ve already tried different approaches to fixing your stutter and haven’t found anything effective, hypnotherapy might be what you need. Hypnosis is a gentle form of therapy that helps you look into your mind to resolve whatever mental and emotional issues may be contributing to your speech impediment. Hypnotherapy may be the key to conquering your stutter and living as normal a life as possible.